"Courage is a virtue and heroism is admirable, but do we have a right to demand them? Which of us cannot look back on his or her own life and remember decisions, or compromises made, or silences kept because of cowardice"
Theodore Dalrymple about Captain of the MV Costa Concordia which sank off Italy in late January 2012. As I write this in March 2012, I have done over 3,250 scuba dives throughout the South and North Pacific Oceans as well as the Indian Ocean and in the cold waters of Northern Europe. I have considerable experience in diving in virtually all sorts of weather and sea conditions as well as with inexperienced and experienced divers. I regularly dive deep (over 45 metres) in Sydney, a lot of these have very strong currents. I also do weekly shore dives, including night dives. I have investigated numerous incidents which have led to death or injury as well as ones that have had no major adverse outcome. I have had an interest in scuba diving incidents since one of the very first dives I did where a couple of divers panicked and forced me to take them to the surface quite quickly. Since then I have attended inquests, read transcripts of inquests and every book on diving deaths that I have seen in order to better understand why diving incidents happen. I have even investigated for my dive Club a couple of incidents where people have ran low or out of air on dives. For this article I had access to the full transcript of the Coroner's Inquest into Tina's death - see references as well as all the evidence available to the Alabama State prosecutor and the defence in the 2012 trial. I hope this article is as accurate as I can make it. Of course, some of the assumptions I have made are pure guesses and are even contrary to what other "expert" opinion on the matter stated at the time of the Inquest. However, I think that my experience and my logical (IT trained) mind can let me work successfully through some of the unknowns. I was also the defence's expert dive witness for the murder trial and I attended all the latter part of the trial. In the following article, I have put some comments in indented italics when I want to explain something, especially to people who are not scuba divers. I have also put some smaller comments inside square brackets [like this] which are also explanatory. Numbers inside brackets [pg 761] refer to the page of the Inquest transcript. Christina Mae "Tina" Burge was born in Germany on 13 February 1977. Although biologically the daughter of William Edwin "Tommy" Thomas III and Mary Cynthia "Cindy" Burge, she was legally registered as the daughter of Cindy's then husband (first name not known to me) and Cindy Burge. On 24 January 1980, Tommy and Cindy (by then married), formally adopted Tina and her name was legally changed to Christina Mae Thomas. They were then living in Walker County, Alabama. They lived in the 1990s in Louisiana but moved to Birmingham, Alabama in the late 1990s. From a young age, Tina suffered from a medical condition called Paroxysmal Supaventricular Tachycardia. This exhibits itself by rapid heartbeat which can cause palpitations, fainting, convulsions and sometimes even death. Tina was put on a drug which controlled it but it had the side affect of making her feel unwell and with no energy. She decided to have it treated by minor surgery. This was done on 16 August 2001. This appears to have corrected the problem and she was said by her family to have been remarkably healthier from that day on. Tina was engaged to Scott McCulloch but she broke off the engagement. I am not sure when this was. Her friend Melinda Kayton said that Tina's mother did not approve of the relationship. She then went out with a bloke called Stan Marks for two or three years (I think) but they broke up in December 2001. On New Year's Eve 2001 Tina attended a party at which David Gabriel "Gabe" Watson was also present. Gabe was the son of David and Glenda Watson. For some information about Gabe's girlfriends before Tina, click here. They were in classes together at the University of Alabama at Birmingham and it seems that Gabe may have asked Tina out a few times (unsuccessfully) over this time. Gabe bought Tina a handbag when he went to New York sometime before Christmas that year. This pleased Tina as Stan had not got it for her when he went there earlier in the year. A few weeks after the New Year's Eve party they started going out. There were reports that Gabe did not appear to be able to commit to a permanent relationship with Tina, but considering they were married within 20 months or so of first going out, this may be an exaggeration by some people. It is also said that the lead up to their engagement was strange, with Gabe purchasing a ring and letting Tina know he had it but without ever asking her to marry him. It is unclear to me how accurate this might be, but has been put in statements given to Police by Tina's family and friends. Gabe has said to me (in 2012) that he purchased the ring but was trying to find the perfect time to ask Tina to marry him. I have also heard that they actually purchased the ring together, but I am not sure if this is correct. On 10 February 2003 Gabe phoned Tommy Thomas and attempted to ask him for Tina's hand in marriage. However, Tommy insisted that Gabe had to do this in person. On 15 February 2003, Gabe and Tommy met at Books a Million Coffee Shop, Hoover, Alabama. Here Gabe asked Tommy for permission to marry Tina. Tommy was to later state that he had never actually told Gabe that it was okay for him to marry Tina. 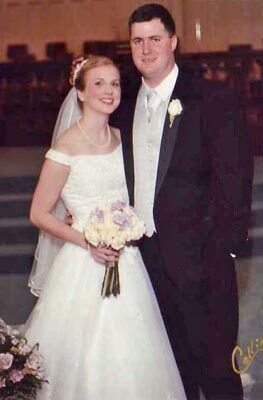 However, Gabe did not ask Tina to marry him till Easter Sunday, 20 April 2003. He did this by setting up an Easter Egg Hunt at Tina's apartment and one thing that she found was a note asking her to marry him. She did not actually say that she would marry him, as she "jumped up screaming so there was really never a yes or no" [Gabe's comments in Insurance Deposition]. In statements to Police, Gabe says that Tina told her Dad the next day but Tommy says it was not till 27 April 2003 when Tina came to their place that Tommy and Cindy knew about the engagement. Gabe went to elementary, middle and high school with a bloke called Michael Moore (better known as Mike). They were very close friends and in 1996 they decided to do a scuba diving course. They did this with The Dive Site. This was located at 1533 Montgomery Highway, Hoover (a suburb of Birmingham, Alabama). There was also another shop in Birmingham. These were owned by Steven Johnson. At least the Hoover shop closed down in 2005. This course was taught by instructor Tom Jackson Jnr. Click here to read the actual statement or evidence about this matter. Pool training dives were done in a normal swimming pool and the other dives were done at a an old quarry which was then called Alabama Blue Water Adventures. I will refer to it as Blue Water Quarry. Click here to read about my dive in the quarry in February 2012. These are the "open water" dives, but in reality they are like being in a pool. 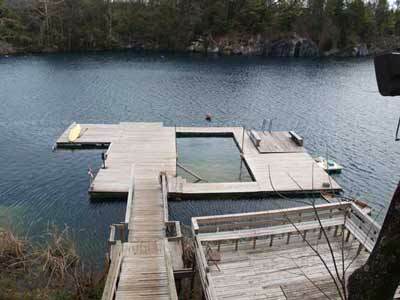 Diving courses used a series of "pools" created by timber structures. The visibility in the quarry seems to vary between 3 metres (10 feet) and 15 metres (50 feet). I have dived the quarry and it was the easiest dive I have ever done, even though it was very cold. The course was an accelerated private course with only Gabe and Mike as the students. The first dive recorded in Gabe's log book is not actually a dive, but a snorkel. He then did four dives totalling 157 minutes, two of which were in the Blue Water Quarry. The final two dives of the course were done at Morrison Springs in Florida, again, a totally controlled environment rather than a real open water environment. I believe that he then did a dive in the ocean at Panama City, Florida, on the wreck of a US Coast vessel, USGC Strength. It seems that two weeks later they went back there again and then dived two sections of a bridge that were sunk as artifical reefs. Note that in his log book it appears Gabe recorded the shipwreck dive twice. Gabe purchased his dive equipment when he was doing the course. They later did Advanced Open Water, Nitrox (at least Gabe did) and Rescue Diver. All these courses also appear to have been instructed by Mr Jackson and were also private courses [that is, with no other students]. Blue Water Quarry from the shop area Kelly and I descending in the training "pool"
In July 1999, Gabe and Mike went on a dive holiday to Cozumel in Mexico [not Cosmill like the Queensland Police transcript states] with Tom and Tom's girlfriend Shelley. On this trip, when swimming along at about 50 to 70 feet, one of Mike's weight pockets fell out of his BCD [BCD - buoyancy compensator device - the vest that holds your tank and when inflated with air keeps you neutrally buoyant]. This of course made Mike buoyant and to stop him floating to the surface, Gabe grabbed hold of him and kept him at the same depth till Tom retrieved the pocket from the bottom at about 75 feet. This showed a bit of skill on Gabe's behalf, although at the Alabama trial Mike said that he froze and held onto Gabe. He said that both of them did not know what to do and they panicked a bit. On this same trip Mike reports that they did a dive in a 5 knot current. He says that it was so strong they could not swim against it, but could only hold their position when swimming hard. This indicates to me that this current was about 1.5 to 2 knots [most people totally overestimate the strength of currents - at least in terms of knots]. When they did their Rescue Divers course [in July 1999 according to Gabe's log book], they did this at the quarry. During this course, Shelley was also present. During the course both Tom and Mike confirm that they did searches as well as retrieving "unconscious" divers and bringing divers back to shore. It also included all the methods of calming a panicking diver [this is all relevant later]. However, Gabe's only dive on this course was for 10 minutes, so he did not really get much practice. They did at least one other dive trip to the Gulf of Mexico [I think that Gabe may also have done another trip or maybe even two but there is a conflict between his paper log and his computer's log]. These were to dive wrecks out near Panama City (a city in Florida). Apart from these dives, it seems (according to Mike) that the majority of their dives were done in the freshwater of the quarry. Gabe and Mike stopped diving together when Mike got a girlfriend (later his wife). Their last dive was about 2002. When asked their level of experience, Mike said "I wouldn't say 'experienced'". On 11 October 2003 Gabe was already an experienced diver [according to newspapers - but what they consider experienced is probably not what I consider experienced]. In the Australian ABC Australian Story double episode Unfathomable about this matter, Wade Singleton, the Trip Director on the Spoilsport said that Gabe had 50 dives, "so [was] a competent, capable diver". Average depth of these dives was only 46 feet (14 metres) and average time 23 minutes. In addition to the dives in his paper log book, there were 13 other dives recorded on his computer that do not match any dives in his log book. Of these, 5 were less than 15 feet. I do not know the bottom times for these dives as it is not recorded in his computer printout. Therefore, it appears that Gabe had possibly done 66 dives, but 13 of these dives may have been done by someone else using his computer (I will ask Gabe about this). Of these, I would only count perhaps 48 (39 from his log book) as real scuba dives [that is, ones I would personally record as dives and ones which would enable the person to actually gain some benefit from in terms of experience]. Of the 53 actual scuba dives dives in his paper log book, quite a few [at least 18] were his Open Water, Advanced, Nitrox and Rescue training course dives, all of which were done in the calm waters of the quarry at Birmingham or Morrison Springs. Therefore, outside his courses, Gabe had only done 27 dives in his log book that were real, non-training dives. When you take out the dives done where his instructor was present, then there were only 13 dives that he did without supervision. Comment: I doubt that I would ever call a diver with as little as this number of dives "experienced". This is especially considering most of his dives were in freshwater in a quarry. While I have come across a couple of people with this little experience who are already extremely competent divers, it is very rare to find someone with so few dives who I would say was experienced. Fifty dives is less than the number of dives I and many of my friends do in about four or five months. It also seems that he had not dived in salt water for about four years, although 6 dives recorded on his computer but not in his log book may have been in saltwater. The large number of very short or shallow dives indicate that he either had a lot of problems with his ears and/or he used his air so quick he could not stay down longer. By comparison, for my first 66 dives I averaged over 46 minutes (double Gabe) a dive and a depth of almost 50 feet (similar). When I dived the quarry in the Winter of 2012, in water that was only 13°C, we did a 45 minutes dive using an ill-fitting wetsuit. It was comfortable. Click here to read about my dive in the quarry. It also appears to me that Gabe may never have actually dived in the ocean without a dive instructor accompanying him. Comment: Of all the dive courses I have completed, I think that the Rescue Diver course (at least the PADI one I did) was the most informative and useful course I have done (apart from the original Open Water dive course). I would have hoped that Gabe gained a lot of experience from this but from his later comments, it appears he did not. However, his only dive on this course was 10 minutes long! 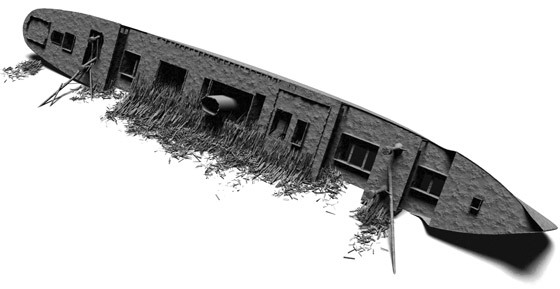 Comment: Dives 55 and 56 appear on Gabe's computer as having been done on 1 January 1996. It is possible that he removed the battery after his previous dives in May 2002 to save the battery and any leakage problems. Thus the clock was reset to the default date. As far as I can see, Gabe did 15 dives in the ocean, but there are three other dives on 28 July 2001 that appear may be ocean dives, although Blue Water Quarry is at least that depth. Before they were married, it seems that Gabe talked Tina into doing a dive course. Tina's friend, Amanda Phillips, said "if she wanted to see him on the weekends she needed to take up these hobbies with him so that they could spend time together". Gabe had been promised a trip to Australia to dive the Great Barrier Reef as a university graduation present. According to Gabe's mother, Glenda, it was Tina's idea to make it their honeymoon as she wanted to see turtles. A week in Sydney was added so that Tina could do some things she had wanted to do. Gabe's father, David Watson, and his grandmother paid most, if not all, of the $10,000 cost. Tina did her dive course with The Dive Site with Tom Jackson as the instructor. In addition, Tina had purchased all her dive gear for over US$1850 (at that time, about AU$2600) on hire purchase on 6 March 2003. She did this before she commenced her course. Comment: I would never recommend anyone buying their gear before completing a dive course or even before doing a few dives after the course in case they do not like it. By purchasing the gear before completing the course, there was even more pressure on Tina to successfully complete the dive course rather than pull out. Her course started on 7 March 2003 and the first dives were in a swimming pool. After the first day, during which Jackson said that Tina was not very comfortable, she did not come back on the Sunday. Jackson phoned her on the Monday and she said she was having problems with taking her mask off. They went to the pool alone and did many private training sessions. Then, when they were about to do the open water training at Blue Water, Jackson got Jim Lang [perhaps Lane? ], another instructor, to do some more pool sessions with Tina. 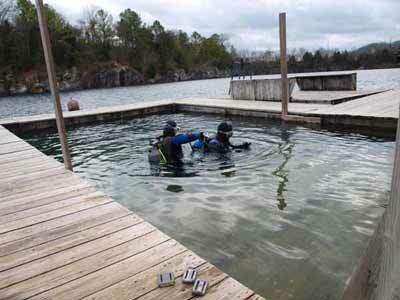 As mentioned, the open water training was at the same quarry in Birmingham where Gabe did his course, Blue Water. Craig Cleckler, who was the divemaster assisting Tom Jackson on Tina's course, commented that "he'd never seen anyone as ill prepared to dive" when she was doing her course. Click here to read the actual statement or evidence about this matter. Cleckler identified Tina as a possible problem from the way she behaved in the water. She panicked when doing her very first dive in the quarry, something that is probably relevant considering what later happened. Craig had to take her to the surface and back to the shore. She confided to Craig that she had to complete the course, implying that it would keep Gabe happy. "Christina [sic] was probably the most panicked diver that I have ever worked with before" he said at Tina's inquest. He also said in his statement that she was "hysterical" and "shaking". "...that woman was so unusual and how she reacted"
"I identified her as being a very anxious..."
"I remember like yesterday because of that one conversation her and I had on the surface"
After this, she did some more pool sessions with Jim Lang and he said she was now okay. Tina did end up finishing the course (on 8 June 2003). Note this date as claims have been made that she did not finish the course till just before the trip to Australia but I think people have confused her not actually receiving her certification card till just before the wedding. There was some delay in getting the card as she did not get her photos to Jackson for about a month after they finished. Tina really has to be considered a suspect diver. After the course it is said that she apparently did some other dives, but she only had completed 10 or 11 dives at the most. This includes the training dives in the swimming pool [I think]. All of the other dives were in the quarry. The deepest she had been was said to have been 50 feet (15 metres) but I can find no real evidence of this. Her computer showed a maximum depth of 30 feet before the final dive and as she had it from the first dive of her course, it does not seem that she really had been to this depth. In addition, there are no currents or waves in a quarry and it can be very easy diving if the visibility is reasonable. Gabe and Tina had certainly never dived together in saltwater [page 25 of tape 3 of Police interview dated 27 October 2003]. Gabe would later state in the same interview that he thought she had done a few in saltwater. I know that he did not dive with her in the ocean. It is possible that Gabe thought that she had done some ocean dives at the end of the course like he had. There is also a statement somewhere that she did go to the coast to dive on a weekend but the dives were cancelled. Gabe and Tina only appear to have done one dive together and that was to nine metres in the quarry, although Gabe told the Police in his first interview that they had done four or five dives together, all in the quarry. If they did, then they do not appear in Gabe's log book or on Gabe or Tina's computers. Tina told a passenger on Spoilsport that she had done 11 dives. It seems to me that she recorded her training dives in the swimming pool as well as a snorkel dive. 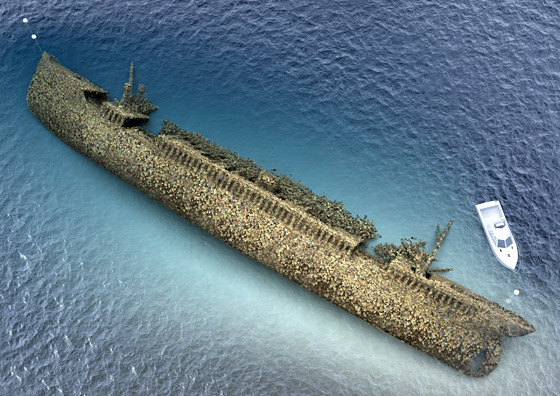 Comment: Note that the computer only retained detailed records of nine dives. I had thought that the dives numbered 3, 4 and 5 may have been test dives done by the manufacturer in a pressure chamber as they are all to 7 feet. However, I now believe that they were the dives that Tina panicked on when training. Her dive training record shows that she did five dives for her course in the quarry (on 7 and 8 June 2003), but as far as I can see, her computer really only shows four dives on two consecutive days (dives 6-9) which are presumably these days. Therefore, the limit of her diving since her course was one dive to a maximum of 30 feet (9 metres) which is pathetic preparation for diving the Yongala (27 metres). Note her maximum bottom times are mostly less than 17 minutes, with only one of 33 minutes. This indicates that she probably used her air so quick she had to end the dives. Another interesting thing to note that if this course was done in Australia, it would not have qualified her for a dive certificate as the Australian Standards (AS) at that time required a person to complete four open water dives which must be in an environment which is subject to wind, swell, currents or waves. In no way could the quarry be considered open water under the AS definition. In addition, the dives must be at least 20 minutes in duration (none reached that), all must be deeper than four metres (this was met), two must be to at least 10 to 18 metres (not met), at least one to 15 to 18 metres (not met), one must be a boat dive (not met) and at least 100 minutes in total (not met as she only did 60 minutes or 73 minutes if you include the three 7 feet dives). Tina and Gabe's relationship as related in Honeymoon Dive was certainly not the normal sort of relationship when you think of most couples. It is possible that Gabe did not really love Tina as when asked by Tina's father (Tommy Thomas) if he loved her, Tommy said he declined to answer or ignored the question. However, a statement by Mr Thomas presented at the Inquest [pg 85] says Tina told him that she loved Gabe. It seems as though she was intent on getting married to anyone, just so she was not seen as been an "old maid" (not that she was of course), as all her friends and sister had already got married. It is possible that she decided that Gabe would be better than no-one. Tina told her co-worker Debra Barnes "I love him". Gabe was said by his friend Mike Moore (who after 2002 had little contact with Gabe due to meeting his now wife) to have been an easy going, laid back and humorous person. He said Gabe could talk to anyone. Gabe does not, again on the evidence offered in Honeymoon Dive, appear to be like this. Having now met Gabe and spent a fair bit of time talking to him, I would tend to agree with Mike's opinion. Gabe also told me "our family has a weird sense of humour". From some reports Gabe also appears to have been a selfish and overbearing person. However, the more I find out about this case the less I am convinced of this idea. An example may have been the decision by Gabe that Tina had to get a new car but which really may have been just because her small sports car was not really suitable for a six foot three 220 pound (190.5 cm and 100 kg) bloke. The only real thing that I can see that supports this is that it is reported in one statement to police that Gabe said "well, that's Alanda's problem" when Tina said that she would need to help her pregnant and now single sister (Alanda) after the baby was born. While it appears Tina's family were never keen on Gabe, statements to Police seem to indicate that they appear to have not done anything to try to make him welcome. Tina's mother, Cindy had apparently said when asked to dinner by Gabe's parents "Why? Tina is marrying into your family. We're not". I am sure that this would not help matters. Reverend Craig Greer, who married Tina and Gabe, stated "They were very much in love....It was just so much fun to watch them. There was a lot of bantering back and forth". I have met Reverend Greer and he seems very sincere and close to Gabe's family. Comment: I have been told by a number of people with knowledge and first hand from Gabe's family that Tina seems to have almost been adopted into Gabe's family in the period leading up to the wedding. It was implied to me that she became very close to Gabe's mother in the six months or so before the wedding. This may explain a lot of what went on after Tina died. A few days before the wedding, Tina had to pick up Gabe's dive computer from the dive shop. Gabe had put it in for a service as it had not been working. In one of his statements to Queensland Police, Gabe said that he had replaced the computer battery before he left the USA. However, the Australian Oceanic technician who gave evidence to the Inquest, Adam White, stated that the battery in the computer was the same as the original brand that came with the computer and it was rare to see this. He implied that it was in fact the original battery. [I now think that perhaps Gabe was removing the battery from the computer when he was not using it and when he put it back in, he had put it in back to front and then could not figure out why the computer was not working]. The manual states if you are not using the computer for more than one week you should remove the batteries. Mr White stated at the Inquest that the battery compartment was poorly marked and it was easy to put it in back to front. In addition, he said that the battery for the computer is inserted by placing it in one direction but the transmitter that goes with the computer has the battery inserted in the opposite direction. More about this later. This was confirmed at the Alabama trial. At 10 am on 9 October 2003, Tina and her best friend Amanda Phillips went to The Dive Site where Gabe had put the computer in to be repaired. When the shop owner (manager?) returned the computer he stated that "the batteries were in backwards". This is why it was not working. I originally thought that she was charged just under US$10 for this but I now think it was free and the charge was for pages for her log book. Note this comment about the battery for later reference. When organising the trip, Gabe also took out travel insurance. What he did not realise was that scuba diving was an activity not covered in the policy he was offered [in my experience this is very unusual, at least for travel insurance sold in Australia, as I have never seen such a policy]. This was sold to him by the travel agent who organised the honeymoon travel arrangements and who knew he was planning to scuba dive in Australia. It was variously reported that Gabe had tried to get Tina to increase her work provided life insurance and also make him the beneficiary. The basic one-unit life insurance component was free as part of her salary package. Tommy Thomas said in his statements that Tina told him that Gabe wanted her to increase the life insurance units up to the maximum [of three units of her salary plus another unit for accidental death] and make him the sole beneficiary. The beneficiary was at this time Tommy. He told Tina to tell Gabe that she had done this. However, it was not possible for Tina to increase the insurance till after she returned from the honeymoon. In addition, she could have made Gabe the beneficiary at any time but she did not do this. Gabe told me that Tina never told him what her father says he said to tell Gabe. In any case, the amount involved was not huge, only US$33,000. The work insurance could be increased once a year [in November] to a maximum of four times this amount plus another time for death by accident but you have to pay for this increase. It is possible that marriage could invoke a chance to increase, but this is not clear. In any case, it is most likely this could not be done till after the actual wedding. Gabe certainly made separate inquiries about stand-alone life insurance, but this was not proceeded with. It seems that in the US [let me know if I am wrong] that life insurance is far more common than it is in Australia [where superannuation is compulsory and Government pensions provided for all without means]. Note that Sonja Jordan who worked with Tina at the Parisian department store [then a 38 store upmarket chain founded in Birmingham] said that a month before the wedding, Tina had told her that Gabe and her had taken out "huge" insurance policies. This does not appear to be true. A lot was made out later about this and one of the reasons the Queensland Coroner later decided that Gabe was to be charged with murder (point 52 of the Inquest findings) was that he decided that Gabe thought Tina had increased the insurance and made him the beneficiary. Thus, this was the reason for Gabe murdering Tina. Comment: As someone who got married relatively recently, I do not find Gabe's request to Tina to increase the insurance and to make him the beneficiary at all strange. Kelly and I both reviewed our superannuation/insurance coverage and both changed who was to benefit before the wedding (well before in fact) and also changed our wills. It is prudent to do this, especially if you are entering into debt for a house as Gabe and Tina did. Even at the wedding rehearsal, there was a kafuffle. The Watsons claim that Tina's mother, Cindy, had said she would refuse to pay for the wedding if everything was not done to "her" liking. As you can see, there was a lot of animosity between the families. However, this may not be true and the reports may be greatly exaggerated. During pre-wedding counselling, Tina told Rev Craig Greer (who married them) that she was in therapy over family issues. At one point she asked the Watsons if they would pay for the wedding if her parents would not pay for it. Tina also sometimes used Gabe as an excuse to not do things with her parents rather than admit that she did not want to see them. One of the relevant things when looking at this whole matter (not just the diving related part) is Gabe Watson's character. The book Honeymoon Diver as well as statements and evidence from Tina's family and friends paint him as a jealous control freak, who needed to exert his power over Tina. However, my examination of this whole subject has indicated to me that this may not really be the case. I have added a separate page that provides some prima facie case that Gabe was neither a jealous nor controlling person. Click here to read a page on a statement given by Farah Vines, a former girlfriend of Gabe. This also has other evidence that shows that three other girlfriends were still on good terms with him, thus showing that he was probably not the control freak he has been made out to be. The wedding was held on Saturday 11 October 2003 at the Southside Baptist Church, Birmingham, Alabama. The reception was held at the Pickwick Hotel, Birmingham. There are no reports of problems between the families at the wedding, so presumably all was well. Gabe and Tina spent the night at the historic Tutwiler Hotel in central Birmingham, a very nice hotel (Kelly and I stayed there when attending the trial in 2012). As mentioned, the honeymoon was a trip to Australia. Some, if not all, was apparently paid for by Gabe's grandmother and his father as a reward for his graduation from university. On the evening after the wedding, it seems to me that Gabe again removed and replaced the battery from his computer. This again reset the internal clock in the computer back to the default date of 1 January 1996 (more details about this and its relevance in part 5). Two days after the wedding they travelled to Australia, departing the US on Monday 13 October 2003 and travelling via Houston and Los Angeles. They arrived in Sydney on 15 October 2003 (remember, they crossed the International Date Line and lost a day). Almost a week was spent in Sydney. They went to Darling Harbour, the Aquarium, Australian Museum (I think), Taronga Zoo, Manly (on the Manly Ferry), the National Maritime Museum and the Opera House. In the video Gabe took while in Sydney, Gabe and Tina certainly appear happy and having a good time. They also "banter" a lot (as mentioned by Rev Greer above). Some examples are Tina sitting on the toilet in ex-HMAS Onslow, a submarine, and getting Gabe to video her. Gabe also calls Tina over to look at the way the toilet in their hotel room flushes. There are also other scenes on the submarine and at the zoo and aquarium. They appear to be having fun. During the visit to the aquarium, Gabe videoed signs warning about dangerous creatures. He or Tina may also have taken photos of these signs. Adverse comments were later made by Tina's friends about the ghoulish nature of this, but it is common for overseas visitors to do this. On 21 October 2003 they flew to Townsville in northern Queensland. Gabe later told Paula Snyder [another diver on the boat] that the first part of the honeymoon was to be Tina's week and the second part Gabe's week. For his part, Gabe had booked a dive trip on the Mike Ball Dive Expedition (MBDE) boat Spoilsport. This is a large liveaboard dive vessel. The main aim of the trip was to dive the historic shipwreck SS Yongala. 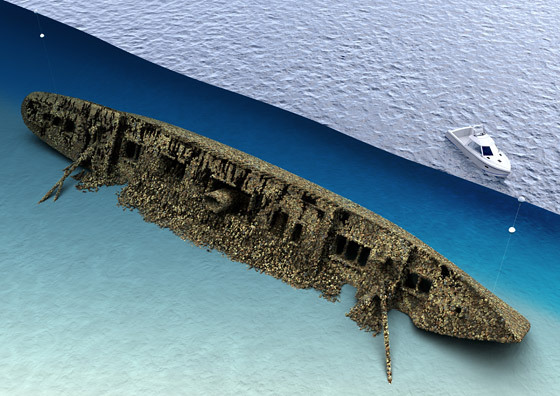 The Yongala sank in a storm in 1911 12 nautical miles (22 kilometres) off Cape Bowling Green, east of Townsville. The shipwreck is a declared historic wreck and it is considered one of the premier dives in Australia and one of the top dives in the world. The coral and other growth on the wreck has made it probably the best combined wreck/reef dive in the world. More about the wreck later. Tina told her family and friends that the reason they were going was so she could see turtles as it was supposed to be the "turtle migration" season [I do not believe that there is such a thing as a migration season that could be seen when diving]. Gabe later claimed [in the Police Interview of 27 October 2003] that he "didn't know anything about the dive before we did [it]". Click here to read the actual statement or evidence about this matter. It seems that he did not really research the trip as well as he should have. He had learnt about the Spoilsport from Bill French, someone who worked or dived with The Dive Site. Gabe and Tina boarded Spoilsport at 8 pm on 21 October 2003 (not 10 pm as reported in some statements). They were using their own gear (apart from tanks and weights). See the following section about the Safe Scuba System and the interviews. Before or after being interviewed, all the passengers set up their gear on the back deck. Louise Johnstone [now Forster], a volunteer deckhand on the boat, watched Gabe and Tina gear up. She said that Gabe "was trying to put the regulator on the wrong way". However, this may actually refer to Tina as the next sentence in the inquest transcript says "she was just very clumsy" and "Gabe was quite controlling over her". Gabe did state that he put Tina's BCD and regulator on the tank as the BCD was hard to do up. All pasengers were also briefed on the operation of the vessel and safety requirements. The Police forensic review of Tina's equipment says that Tina was using a 63 cubic foot (about 8.6 litre) aluminium scuba tank. From experience and comments, it was apparently filled to only 3,000 psi (203 bar) when a full tank would be at least 3,190 psi (220 bar) or even 3,480 psi (240 bar). However, I have now seen a photograph of the tank used by Tina (and physically examined the tank at the Alabama trial) and know that it was not actually a 63 cubic foot tank but was a 10.3 litre water capacity tank (approximately 80 cubic foot). It is not clear why the expert police witnesses did not report this correctly when it is so obvious. Comment: While the 63 cubic foot was a totally inadequate tank size for anyone diving this wreck, let alone someone with as little experience as Tina, the 80 cubic foot tank is a bit better. Neither I nor my wife, who both have low air consumption rates, would even consider using a 63 cubic foot tank for this dive. A minimum size would be an 88 cubic foot (11 litre) tank, although an 80 would be more acceptable than the 63. The Spoilsport left Townsville wharf at 8:30 pm and moved to the refuelling wharf, arriving there at 8:50 pm. At 9:40 pm refuelling was complete and the boat headed out for the Yongala. At 1:15 am on 22 October 2003 it moored near the Yongala. At 8 am it moved to a mooring. On board there were 12 crew, 3 commercial divers and 25 passengers. Queensland has probably the tightest laws relating to scuba diving using a commercial operation (as distinct from a private boat) in the whole of Australia, if not the world. They have a code of practice that is enforceable in law under the Workplace Health and Safety Act 1995. Basically, this says that the Industry Code of Practice sets certain standards and requires that operators set standards for other procedures or even different ones for the ones that are set. They do this via their own code of conduct or a manual. Dive Manual (Staff) - 4: Trip Director - Management Responsibilities = As directed by Government Regulations, the Trip Director is responsible for implementation of the Diving and Snorkelling Code of Practice. Dive Manual (Key Procedures) - various: Dive Site Selection = Yongla, do as last day and a half of expedition. Between April and August can do as first day if weather is okay. On 19 June 2003 Craig Stephens, Operations Manager for MBDE, sent a memo about the SSS. It was entitled Dive Procedures and WPHS. It said that staff, including Trip Directors, are not always complying with the MSE dive procedures. It also said that "you may be liable for to litigation" if you do not follow and something goes wrong. This was signed by Wade Singleton. On 24 June 2003 Stephens, sent another memo which was directed at the Trip Director and said in part "Ensure green, yellow and red highlighter pens used to colour guests names". This was not signed by Wade Singleton, the Trip Director, but signed by most other staff. Comment: I should note that before I became involved in this matter, I had never heard of dive sites being classified as Red, Yellow or Green. At the Coroner's Inquest and the Alabama trial, it was inferred that all divers should be aware of this and what a "Red dive" would mean. I doubt that Gabe even knew what was meant by the Yongala being classified as a "Red dive". First dive must do Reef/Wreck orientation dive. First night dive must be an orientation dive. After the orientation dive, Marginal skills means they cannot do a dive without supervision. Good skills means no further supervision for similar dives is required. Must attend orientation briefing and debriefing prior to first dive [hard to see how you can debrief prior to the first dive - but that is what it says!!]. Can still be required to undertake orientation dives under another part. This is not really clear, but I think it means if they have done less than five dives in the past year. The other section that covers this contradicts the first part somewhat as it mentions 15 dives without saying ocean dives. It also requires Japanese divers with less than 50 dives to do ALL their dives as orientation dives. My wife Kelly is a risk manager (and a very experienced diver of course) and she considers that the SSS has holes in it everywhere and it does not ensure that divers are appropriately matched to the dive site. Click here to read more about the prosecution (or use a link in a later part if you want). Click here to read the actual MBDE memos and procedures. As is normal on these boats, Gabe and Tina had to show their diving qualifications to the dive boat's crew and in fact were interviewed by Wade Singleton, the boat's dive director. You normally also have to give evidence of your diving experience, although I must admit I have never had to present physical evidence such as a log book. Under the SSS, Gabe and Tina should have been interviewed separately [so that the husband cannot influence the wife's responses about their own ability etc]. However, in a breach of the code and Queensland law, Wade Singleton interviewed them together (admitted at the Alabama trial). One of the problems with MBE's procedures was that while the SSS used ocean dives to work out the experience level of the diver, the forms that divers had to complete DID NOT ask about ocean dives, only total dives. Therefore, Gabe, who had completed 55 dives according to his log book, appeared to meet the criteria to be a Red Diver. However, he had only done 15 ocean dives and was not asked any questions about this by Wade Singleton. Tina had only done five dives, none of which were in the ocean. As such, she was clearly a Green Diver and under the Code of Practice, was required to have an orientation for any dive. She was only offered an orientation dive for a night dive, but Singleton claims he offered it for the Yongala dive as well. Whether he did or did not does not matter, he had no option under SSS except to insist she did an orientation dive. Singleton was also supposed to record that they were Green Divers [Gabe may have been Yellow] by marking this on the forms they completed. He did not do this. He was also to mark with a coloured highlighter each person's status. He did not do this for anyone. He also had to attach tags to their tanks indicating their status. He did not do this for anyone. He was to post a list on the dive deck of all the divers' statuses. He did not do this. Therefore, Singleton failed to carry out his assessment of Gabe and Tina correctly and he failed make Tina have an orientation dive [that is with an instructor or dive master]. This is even more important considering this was a red dive. In addition, the rule saying the Yongala was only to be done at this time of the year in the last day and a half was broken. Therefore, there were at least 6 breaches of Queensland law by Singleton and MBDE. The Yongala was a 107 metre long 3,664 ton passenger vessel. Today she lies in about 27 metres (90 feet) of water. She lies on her starboard side on a sand bottom, with a list of about 60°. The wreck faces north and the top of the wreck is about 14 metres. However, I have seen some diagrams that show the wreck actually facing north-west or north-north-west. Most people state that it faces due north. Even though I have dived it 10 times, I am not sure which is correct as my compass was a bit wonky on the wreck (due to the metal). I have now access to GPS co-ordinates for the moorings, DAPs, bow, centre and stern of the wreck. I have plotted these into a mapping software package. This shows that the wreck points towards 331° which is approximately north-north-west. Shipwreck historian John Riley said it faced 347°. Therefore I think it can be said that it faces north without being too far off the correct situation. It appears there are five moorings, two at the southern end (SE - 901 and SW - 902), one at the northern end (NE - 904) and two in the middle (E - 905 and W 903). As indicated, one of each of these pairs of moorings appears to be to the east of the wreck and the other to the west. Thus, 904 (NE) is the north-easternmost mooring and 902 (SW) is the south-westernmost mooring. There are two diver access points (DAP), one at the bow (DAP2) and one at the stern (DAP1). The diver access points are small surface buoys with a larger orange buoy at five metres. The line continues to the mooring block which is on the sand. These are directly north (DAP2) of the bow and south (DAP1) of the stern. On my dives it appears the mooring blocks are about 10 or so metres off the wreck. The GPS marks mentioned above indicate it is 12 metres from DAP2 to the bow. From the police video of dive re-enactments, DAP2 appears to be about 10 metres off the bow. At about 10 metres down there is a line that runs to the bow or stern of the wreck. It is 56 metres from 904 to DAP2. The charter boats when they arrive hang spare tanks of air [hang tanks] at about five metres or so on the DAP that they are using (it may be both). They also run a line from the stern of their boat to this point on the DAP they are using (one or both). On a personal note, I will not dive in any current more than about 1.0 knots unless doing a one way drift dive. See part 5 for more details on the actual current on the day. When Spoilsport arrived at the wreck, she first anchored some 100 metres or more off the wreck. Then, once it was light enough to see, she moved to the wreck and took up mooring 905 which is the middle east mooring. Gabe and Tina got up between 6 and 6:30 am on 22 October 2003 [from record of interview] and they had breakfast at about 7:15 am. At about 8:30 am [from record of interview] or 9 am [from Coroner's report] a dive briefing was conducted [this is when the crew advise the divers about the specific dive site and what the plan for the dive will be]. At about 6 or 7 am (depends on which evidence you use), Brian Fotheringham and Louise Johnstone dived to set up lines and deco/hang tanks. Brian was an employee of Mike Ball and a master scuba diver instructor with a little under 700 dives experience. Louise was a volunteer deckhand [on her first trip and basically working for free diving] and an instructor, although she only had done 186 dives [about what I do in a year] under her belt. Click here to read the actual statement or evidence about this matter. It seems that they were taken in one of the tenders (a medium sized RIB or "rubber" duck) to the bow DAP. Here they attached a line that was attached to the stern of the Spoilsport. They then descended and attached a tank with regulators at five metres. Brian reported that the current was about 0.5 knots (strong in his words) and that the current was coming from about 10° from the west side of north. He judged this based on where the boats were lying. Louise said that the current was very strong, but she was quarry trained and had done little diving in ocean conditions [I would assess Brian's view as accurate based on all the available information]. Other evidence indicates that the current may have been from the north-west or even the west (see later in part 5). After putting in this line and tank, they did a dive along the wreck and ascended the stern access point (DAP1) and put another tank here and then ran a line back to the stern of Spoilsport. Around the same time, some commercial divers who came out on the boat to replace the lines to moorings 901 and 902 entered the water using another tender. They were employed by Adrenalin Dive. Adrenalin had been contracted by Queensland Museum (which for some strange reason manage the moorings and the wreck) to replace moorings. Paul Crocombe, the Manager of Adrenalin, said that the current at 6:30 am was slight, even very slight. However, he says it was less than one knot. He said that a one knot current was something that an experienced diver would consider a "pretty dive" [!?!?!?! - one knot is strong! - perhaps something is missing from the transcript?]. He confirms Brian Fotheringham's view that the current was slightly across the wreck, presumably from the west. 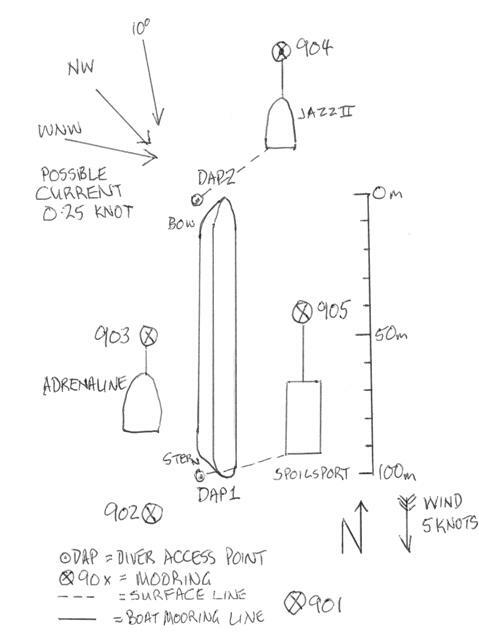 He also said that when mooring 901 was done at 9:15 am, the current was stronger, but he did not actually do this dive. This contradicts most other people's view that it was less later in the morning. Another dive boat arrived at the wreck site. This was the Jazz II which, I think, was operated by Tropical Diving at Townsville [this company does not appear to operate now - at least there is no web site I can find]. I think it arrived around 10 am, although the skipper, Barton Painter [Paynter in some of the inquest transcript] said 10:10 am [I think it was probably closer to 10 am as the divers did not start entering the water till 10:35 am]. Click here to read the actual statement or evidence about this matter..
On board were divers from Townsville as well as divers from Pleasure Divers on Magnetic Island. It seems that Pleasure Divers had about 9 divers on the boat [it is not clear and the inquest papers do not investigate this]. Claims about the visibility on the dive varied greatly. These ranged from about six metres (Gabe saying he could just see DAP2 from 20 feet away) to 22 metres. Neil Joslin said it was 15 to 17 metres, Ken Snyder said it was 15 to 22 metres [50-75 feet in his statement to police] and Wade Singleton said it was 10 to 15 metres. Therefore, based on this, I would think that it was at least 15 metres but probably not 20 metres. The photograph of Tina's body would tend to confirm this. Click here to read the actual statement or evidence about this matter. Click here for the next part of this article.